Elton Danpay and the Rocket Band have got together to tribute to one of their all time favorite and unquestionably one of the greatest artist ever – ELTON JOHN.You will immediately notice the attention to musical detail not only with a full 8 piece band including back up singers, but with over the top costumes and high energy performances like Elton in days past. Elton Dan-Elton John Tribute puts on a spectacular show utilizing digital lights, smoke/fog, and a sound team that delivers nothing less than the best. They can provide full staging, lights and sound equipment for audiences up to 5,000 people. The band is actively booking the 2016 season. An Elton Dan show pays tribute to one of the all-time greatest artists ever: ELTON JOHN. Elton Dan’s rapport and stage presence is second to none and his magical piano playing has a way of engaging you in the full ELTON experience. Before you know it, you’re captivated by his incredible band including backup singers, and thrilled with the over the top costumes and high energy performances just like ELTON in days past. 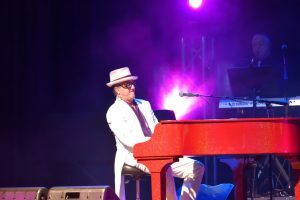 Elton Dan has performed for gatherings of 5000+, but gives each listener the feeling that they are sharing the intimate emotions of the much loved music with just them. For more information, check out Elton Dan on Facebook.